Along with producing content on a daily basis I’m the IT manager for our entire office. One of the biggest troubles that I find myself with on a daily basis is juggling all of the devices on our network and making sure they work properly. From network switches, access points, and end-user devices there is a lot to manage and support. For any IT manager the best day is a day where everything works. I know all too well how hard it is to have a single day of not running around to fix network devices or give the on-site storage server a good kick when it starts acting up. One thing I can count on to work properly in this office is our HP Color LaserJet Pro MFP M477. HP has been gracious enough to send us out a printer to take a look at and it has taken a large amount of stress off my shoulders for maintaining yet another device in our office. 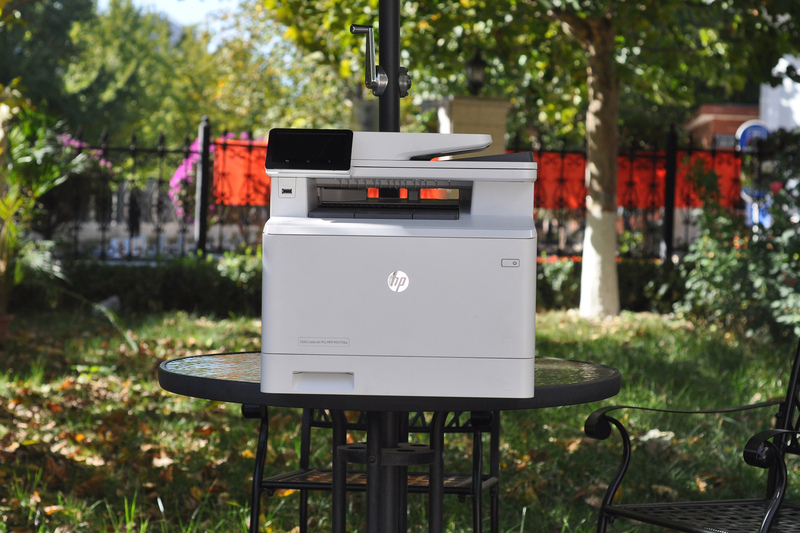 Unlike most other consumer and small business printers on the market today the setup and maintenance of HP’s new Color LaserJet Pro printers has been nothing but the best experience for me. Most other brands on the market require third-party drivers to function properly. With the HP Color LaserJet Pro MFP M477 it was as simple as plugging it into the network and mapping the printer to our user’s machines. HP’s simple drivers and easy administration panel made setup and networking a breeze compared to other models that I’ve worked with before. HP’s no nonsense approach to their administration panel helped me achieve a level of control and ease of use over our office printer that I’ve never felt before. No longer will I see the days of wrestling with a large manual just to get my printer connected to the network, nor will I struggle with botched administration consoles that have simple tasks buried in mountains of submenus. HP’s printer had everything an IT manager like me needs at my finger tips without any hassle or anything extra. With my focus off simple printer errors that seem to plague other printer models, I can focus on other parts of our business network such as upgrading our aging wireless access points or find who is hogging all the bandwidth during lunch time. My point is that HP has taken all of the common gripes about printers in a small business network and actually done something about them. Having a printer that is smart enough to scan to a network share, or even the simple things like custom low toner levels to give me more time to reorder toner is what puts HP over the top of other brands. A happy IT manger is one that doesn’t constantly have to get up and walk half way across an office to fix a simple issue. As the IT manger I can access the extensive web administration page to check up on the health of the printer and manage any printing jobs currently happening on the printer, a huge plus when someone’s print job is way too large and needs to be canceled remotely. There is no end to the amount of time and money saved while HP’s printer has adorned our office, but what I can say is that our office enjoys it more than any other printer we have had in this office and made my job so much easier with something that actually works and is extremely easy to manage and #ReinventTheOffice.